I woke up at 2am and headed for the kitchen at about 3:15am. I turned on the gas, got out the items I bought the previous night and proceeded to make breakfast for my family. I was meticulous about the meal because I didn’t want anyone to feel mummy’s absent. I’m the first of five children and so it’s kinda natural to step into mummy’s roles when she’s out in the North for your cousin’s wedding. A delicious (in my opinion) pot of spaghetti in a mouth watery tomato sauce sat ready on the gas cooker after a bit. I turned to the sink, cleared dishes from the night before and proceeded to Iron my work wear for the day and my seven year old brother’s school wear. I returned to bed at 4:15am and was grateful to God for the gift of power holdings (NEPA). Meanwhile, my seven year old brother slept in another room with my younger sister. I had him crying lightly just before I headed for the kitchen. I went to the room where he laid, picked him up and took him into my bed. I wrapped him up in a wrapper and cuddled him for a bit. Then morning came (6am), I woke the little one up, we said a quick prayer and I gave him a bath, mouth wash and got him dressed for school. I raced into the kitchen to dish my delicious spaghetti (of course I re-heated it). I served my seven year old brother and told him to be done before I’m out of the bathroom. I got out of the bathroom and the food was still sitting on the table. Brother has taken a stroll outside to do only God knows what. Oh you don’t want to hear it. He said, “Nana, the food is not sweet”. (He calls me Nana ever since he began to speak. I later got to know it meant mother in some languages). At his response, My heart sank! I said to myself, I’m sure it’s because it’s hot. I’m aware he doesn’t like his food steaming hot; but couldn’t he just say, I’m waiting for it to get cold? Did he really mean that this “delicious spaghetti isn’t sweet? Well you should know that I’m not the kind to taste a meal when cooking. I just throw in the required measure of ingredients and trust that it’s the perfect measure. 98% of the time, I’m correct! As usual, I cooked this spaghetti the same way. Did you know that after my brother said that to me, I went back into the kitchen and tasted my meal? My confidence in the spaghetti was strengthened. It tasted just right! “So why did Giovanni say my food isn’t sweet?” I thought (Emphasis on MY). I proceeded to pack his school lunch box when I suddenly felt someone hug me from behind. He said, “I’m sorry, it’s sweet. I’ve started eating it”. He turned away and returned to his meal. I shook my head with smiles on my face. The only word that got out of mouth was, “Children”. I returned to find Giovanni raking the remaining strands of spaghetti until his plate came clean. The conventional thought about a woman’s purpose is usually centered around wifery and motherhood. 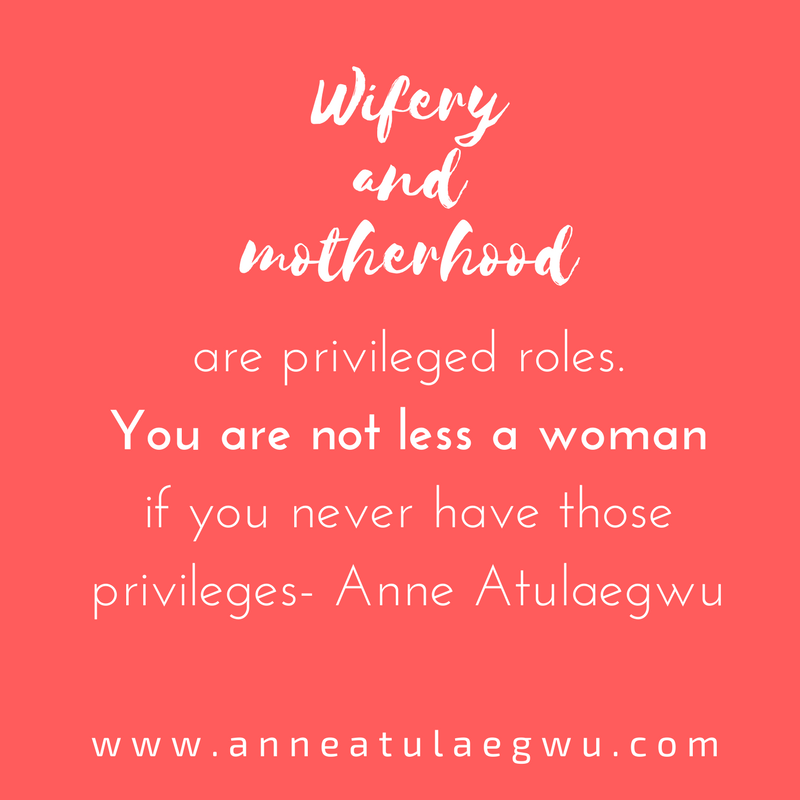 While I do not negate those two as part of a woman’s life, I see them (wifery and motherhood) as roles in which a woman expresses purpose and not purpose in themselves. The society we live in, find it almost impossible to differentiate womanhood from wifely duties and motherhood. Yet, a man is regarded as a man even without being a husband and a father. Something isn’t right about the society’s perception and I will uncover that as we proceed. 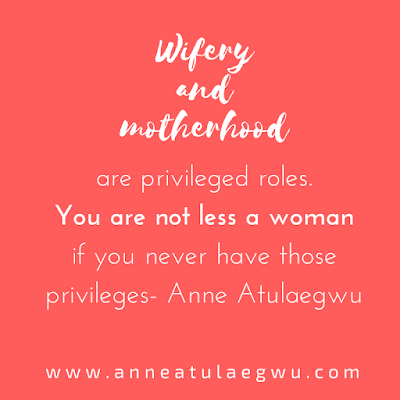 We also cannot deny that the average Nigerian family defines a good woman by how well she cooks, makes a bed, bargains at the market, keeps a clean home and perhaps mend shirts with missing buttons. She is also regarded as a complete woman, so long as she gives birth within the first year of her marriage. Some parts of Nigeria even go to the extent of disregarding a wife’s womanhood if all she births are girls. Do you relate with these? What we don’t see as a society is that roles are an extension of something beyond the obvious. Roles are created based on needs. If needs change, then roles change. Since roles change, roles cannot define a person. And if roles cannot define a person, roles cannot be a person’s purpose. This is why a man can cook his own meals as a bachelor and it doesn’t remove his male organs from its position. There’s a need for him to eat, therefore he fills in the role of a cook. Do we now say the purpose of a man is cooking? Even if he does it for 25 years? This is what we have done to the personality called WOMAN. 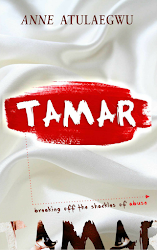 She cooks, she cleans, she births and we say that’s her purpose. I beg to differ. Those aren’t her purpose but roles! The problem with tying our purpose to roles is that we will forever feel inadequate. Did you notice how I felt when Giovianni said, “my food”, isn’t sweet? Although, I didn’t mention my emotions, I’m sure you noticed that his thought about my food bothered me. It was an understanding of his place as a child and my confidence in my culinary skills that made me not feel sad/depressed or unappreciated. I was bothered about how to get him to eat the food not necessarily about what he thought of my food. However, if it were true that the food wasn’t tasty, I WOULD NOT feel like I’ve failed as a woman! I would have tried to make up for it because I can’t have him go to school without a meal. I can let a poor rating of my meal pass because I understand that my purpose is not tied to a pot of spaghetti. Since it isn’t, then a meal rating cannot be the measure of my worth as a woman. Unfortunately, this isn’t the case for some women. A poor rating on their home making skills or approach to motherhood, have kept their heads bowed and their souls broken. Those rating have a weighty effect on their self esteem because they are yet to differentiate a woman’s worth (which is tied to her purpose) from her roles. 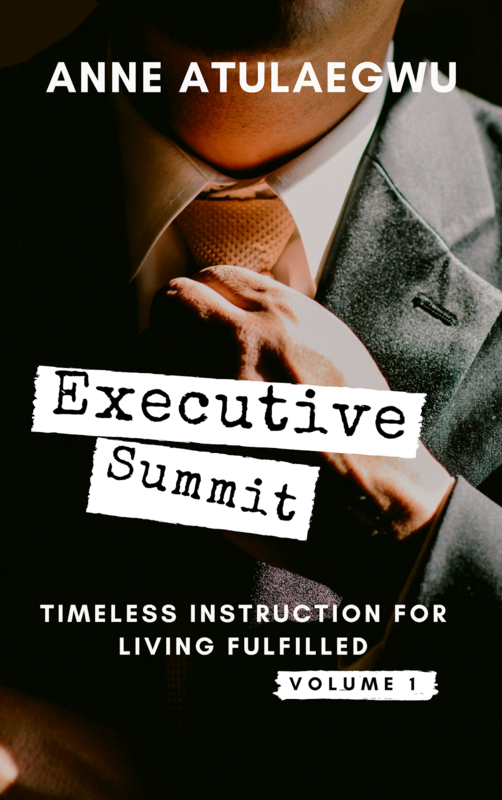 This is not to excuse excellence in our responsibilities as sister, daughter, wife, boss, employee, mother or mother-in-law. I am a woman committed to giving her best in whatever role I have to fill and I encourage women all over the world to do same. 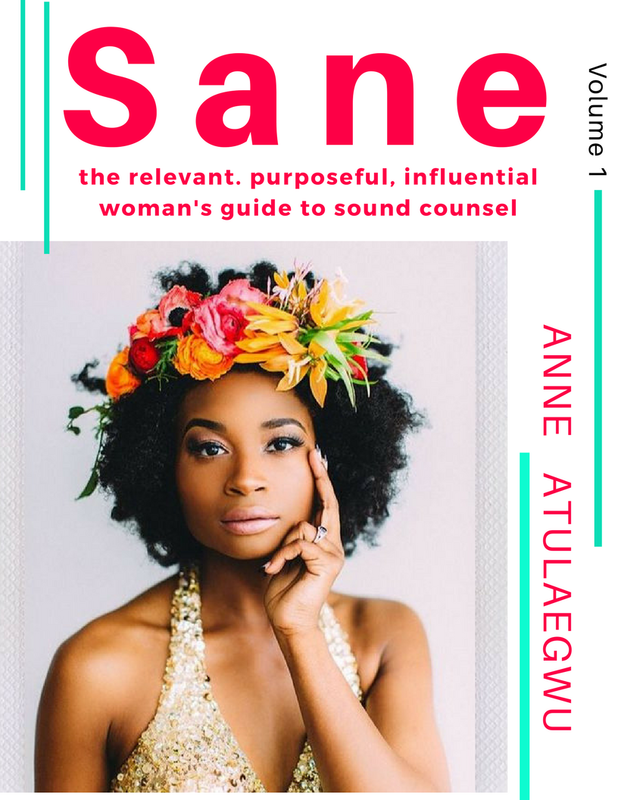 However, it is dangerous to define the value of your worth based on those roles because as roles change, so does the consistency of your performance. I hope I’m speaking in plain English? What is the purpose of a woman? Now if roles aren’t a woman’s purpose and her worth isn’t in her roles but in her purpose; what then is the purpose of a woman? Below is an excerpt from my book Prothesis. “Purpose is the original intent for the creation of a thing. It is the essence or the determiner of an object’s value. Everyone was designed with an intention in God’s mind. When God was forming your eyes, determining the structure of your bones, framing your nose and designing your legs, He did so in alignment with the intents of his heart concerning you. Hence, we must understand that purpose is that reason why God created us. The fullness of our value as humans cannot be attained until we find and walk in God’s purpose for our lives. Purpose refers to the call of God on a life. When we operate outside God’s purpose (calling) for our lives, we waste our potential on irrelevant things. 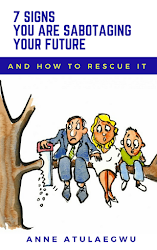 The reason most people live and die unfulfilled in spite of their numerous wealth, is because they spend their time, energy, finance and other resources trying to live out their own purposes rather than God’s. The purpose of a woman is the call of God on her life. The purpose of a woman is God’s design for her life. Man was alone (having no one else present). God didn’t say let’s make a COMPANY. He said let’s make a HELPER suitable (that fits him). It is one who has a task at hand that is helped. Therefore God considered man’s task before he said let us make him a helper. Now to understand what the woman is to help with, we have to look at the man’s task. This is found in Genesis 2:15, “The Lord God took the man and put him in the Garden of Eden to work it and take care of it. Therefore if working and caring for Eden was man’s task for which he needed a helper? Then the reason God created the woman was to assist the man in working and caring for the Garden of Eden. In a sense, the woman was also to work and care for the garden but only as an assistant not a fore runner/boss/lead player. However, both of them failed God, yet the bible never says eve fell or both of them fell. The bible often said Adam fell (Romans 5:12). This is because he was in charge and the leader. God didn’t ask Eve where she was when He walked into the garden. He called out for Adam (Genesis 3:9). When something goes wrong, you don’t question the assistant before the director. By calling out for Adam first, God was saying, I put you in charge. I brought the woman to help and not to run this place. Most preachers use this scripture to explain the place of a woman in marriage. They are right. However, to say that a woman has no “reason” for being until there’s a man in a garden to help is to say single women have no reason for being. That will not only be offensive but wrong. I believe the reason the human race began with a marriage, was because God needed the man and the woman to fill the earth with more people. These people will not be born married and would have to grow from foetus to full adults- an experience that Adam and Eve didn’t have. Therefore, what would their purposes be? The answer to that question is found in God’s original intention for making mankind. Genesis 1:26-27 , “And God said, Let us make man in our image, after our likeness: and let them have dominion over the fish of the sea, and over the fowl of the air, and over the cattle, and over all the earth, and over every creeping thing that creepeth upon the earth” So God created man in his own image, in the image of God created he him; male and female created he them. The word man in the above verses is translated as Adam which means mankind. Hence, the use of the pronoun “them”. Infact, to avoid misinterpretation, the bible clearly stated, male and female created he them. By that we know, that the word man referred to the male man and the womb-man. We agreed earlier that purpose is the original intent, resolve, design for making something right? Now if the above verse clearly states that God’s original reason for making MAN (mankind) is to have DOMINION. Then the purpose of the woman is to have dominion on earth as much as it is for the man to have dominion. Since the word dominion in that verse is translated radah in Hebrew which means to reign. Then, man and woman were created to reign over all the earth. So the first purpose of a woman is to reign! You don’t have to be married to reign! 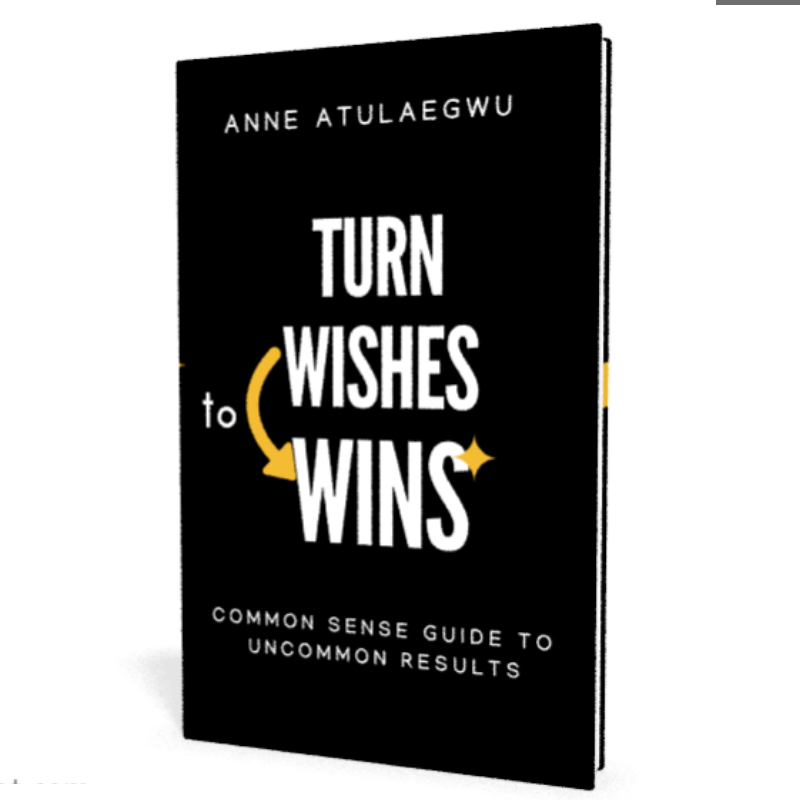 You only need to be aligned with the command to reign! Man (male and female) lost the ability to reign after the fall (Genesis 3) but the ability was restored in Christ Jesus who conquered sin and death (which conquered Adam initially) as seen below. Therefore, the way to align with the command to reign is to be joined (be one) with Christ (1 corinthians 6:17). A person becomes one with Christ by the principle found in Romans 10:9 “If you declare with your mouth, "Jesus is Lord," and believe in your heart that God raised him from the dead, you will be saved.” Been saved qualifies you to receive the spirit of God which automatically makes you one (joined) with Christ (Romans 8:14-15). Now what does it mean to reign? To reign is to have authority, weight, power, influence over a thing or people. This means man was to decide what happens to them and the first expression man gave to this dominion was to name everything. He(Adam) knew the mind of God and so he expressed the mind of GOD in that garden; by expressing the mind of God, man reigned/had dominion upon the earth and everything there in. 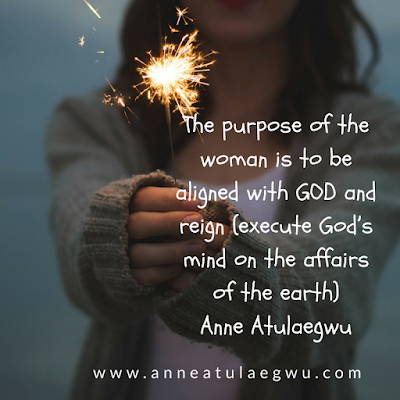 The purpose of the woman is to be aligned with GOD and reign (express God’s mind on the affairs of the earth). Are you expressing His mind/will/intention on the affairs of the earth? 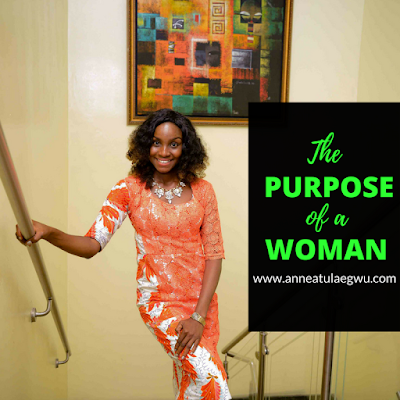 If you are not, then you aren’t living out your purpose as a woman. This truth, is what single women ought to be aware of. We are supposed to draw our identity and worth from how much we are aligned with Christ and establishing his will on the affairs of this earth!! That is your primary purpose, woman! In marriage, your purpose is to help your husband fulfil that purpose of mankind – align with God and execute/express God’s will on earth. Therefore woman, you have not failed, if you burnt the rice last night. You have not failed if the comment about your food is poor. You have not failed if you’ve never conceived. You have not failed if your birthed a deformed baby. You have not failed if you are unable to breastfeed your baby due to one illness or the other. You have failed if the man you married seizes to align with God and execute/express God’s will on earth as a result of having you in his life. The ministry of helps isn’t easy. So stop rushing into marriage! If it were so easy, Eve wouldn’t fail. Being a help meet means you have your opinion and may have to keep it to yourself. It means you have to consult with the man before making decisions. If Eve had consulted Adam, she probably wouldn’t have tasted it such that the sweetness made her give to Adam. You think being a help meet is easy? It’s a huge responsibility because you determine if your man succeeds at the assignment or fails! Therefore, while you wait for your man, rather than scout through all the latest Bellanaija wedding posts and reigning aso-ebi (which fuels some people with envy and discontentment) build up yourself in the Lord. 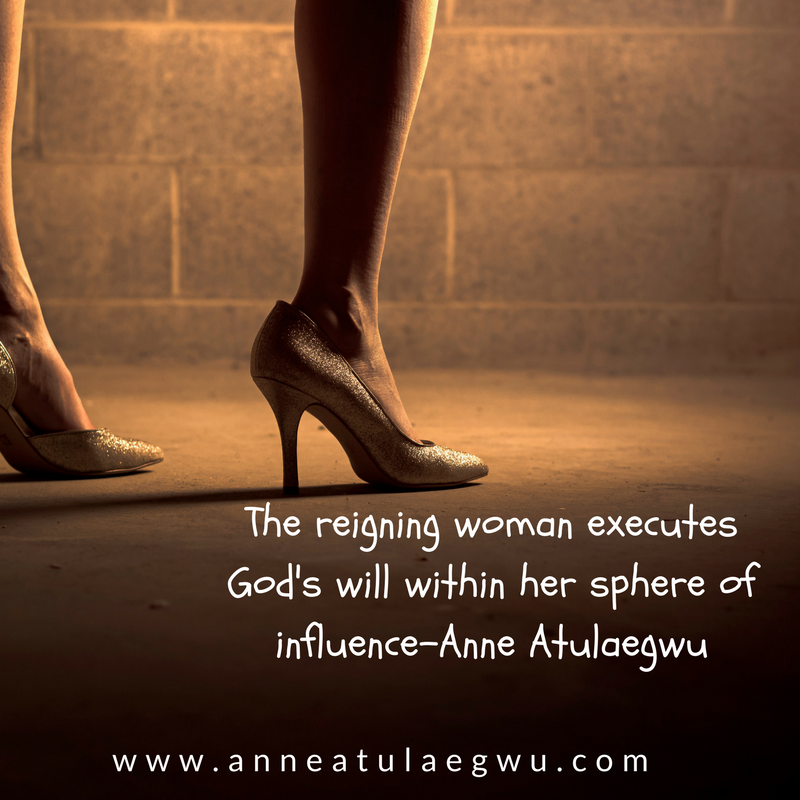 Live out your purpose (align with God and execute/express God’s will on earth) so that when your Adam comes, you will be so used to reigning such that helping him reign comes NATURAL! PS: I am not discrediting Bella Naija please. They are doing an amazing job. I’m saying don’t spend too much time feeding your mind with information that makes you anxious. Know the balance! 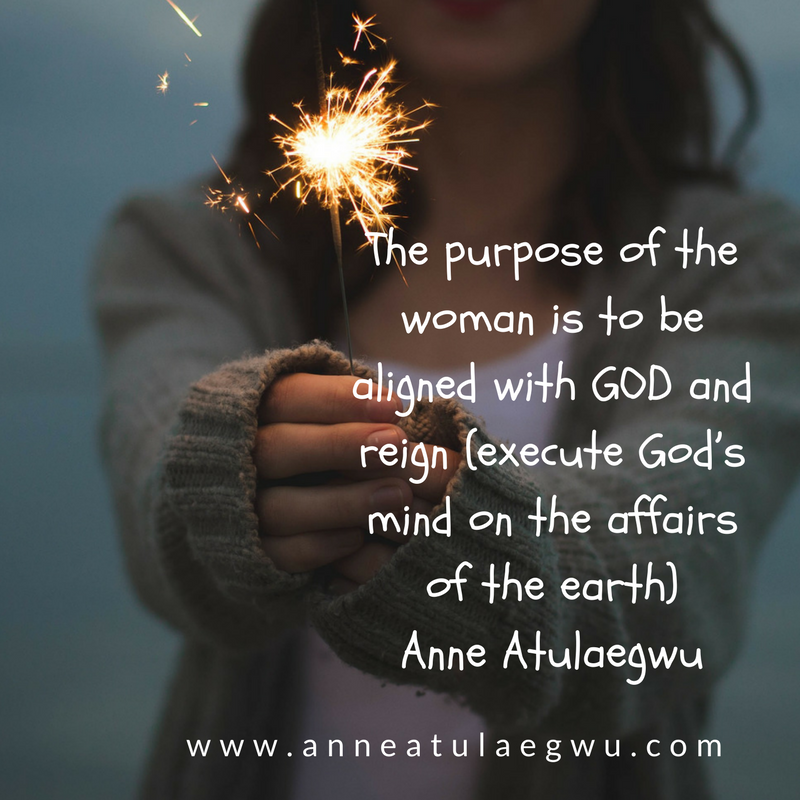 The purpose of a single woman is to REIGN (align with God and execute/express God’s will on earth)) ON EARTH. Woman, are you presently living out your pupose aka THE REIGN MANDATE?